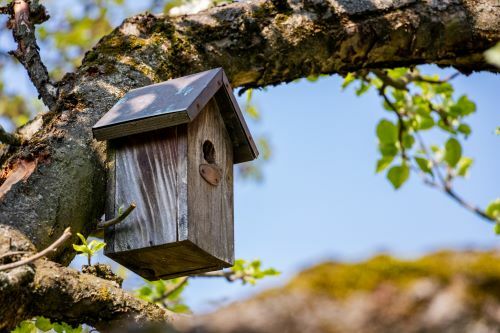 Attract Portland Area Birds with Nesting Boxes | Mr. Tree, Inc.
Do you have beautiful trees in your yard but still feel like something is missing? At Mr. Tree, we want you to have the most perfect-looking home, and that is why we suggest you start attracting Portland area birds to your yard. From their gorgeous colors flying from branch to branch to the relaxing sound of their chirping, wanting to attract birds to your yard is a common desire that will also bring your home to the next level. However, it is not always easy to do. Many people assume that just planting a tree will attract birds. Whereas that sometimes works, it’s not always the case. The real trick to attracting birds to your trees is to use nesting boxes. In order to properly attract birds to the trees in your yard, there are some steps you should take first, rather than just simply building a birdhouse. Each nesting box should be tailored to the species of bird you are looking to attract. Nesting boxes are not a one-size-fits-all situation. Some common Portland-area birds that you can attract are the house finch, the California scrub-jay, the dark-eyed junco, the rufous hummingbird, the red-shafted flicker, the American robin, the white-crowned sparrow, the spotted towhee, and the song sparrow. The birds’ species will affect the type of box you should make. For instance, a sparrow tends to like a small nest box with a hole, whereas a robin tends to prefer an open-fronted nest box. Common Portland area birds tend to be on the smaller side, your nesting box does not have to be made too large. Here is a helpful PDF of nesting box dimensions to provide you with a better idea of size. It is important to remember that nesting boxes are meant to replace the natural homes of these birds. Because of this, natural wood is one of the best materials to use to create this new habitat. Pine, cedar, and fir are all great choices. The lumber that will be used for the walls should be at least ¾ of an inch thick to provide proper insulation. Having an extended or sloped roof will help keep the rain out. To further keep the inside of the nesting box dry, you should have a recessed floor or drainage holes. Additionally, you should not include any adornments on the nesting box, even perches. These could allow predators easy access or allow larger birds to harass the smaller birds taking shelter in your nesting box. It may be tempting to paint your nesting box a beautiful, bright color. However, this may do more harm than good. Toxic paint could actually kill the birds looking to reside in your box! Additionally, a box that is brightly painted could attract more predators. Unpainted, hardwood bird boxes will also withstand the weather much better than boxes that are painted. As birds are an adaptable species, the placement of the box can be left mostly up to you. However, ensure that you are putting it somewhere where it can be easily accessed. This is important because you should clean out the nesting box once a year, preferably during each fall season. Additionally, some species of birds do have a preference as to how high off the ground the boxes are, so that is something to keep in mind as well. In terms of which direction the box should face, there are some things that should be avoided. For instance, if your yard faces a highway or a street that is busy, the entrance hole to the box should not be facing that way. This is to prevent the birds flying in and out of the box from getting hit by a car that may be moving a bit too fast and not see the bird. Additionally, nesting boxes should not be placed in an area that is heavily used by people. Adult birds do not like a lot of disturbances. Furthermore, the box should not be placed in an area where pesticides or herbicides are commonly used. These chemicals harm the insect populations, which is a primary food source for many birds. In addition to this, they can harm the birds directly. The time of year in which you place your nesting box outside is also important in terms of attracting Portland area birds. In the northern regions, boxes can be placed outside before mid- to late March. If you wait too long into the spring, many birds will already have chosen another shelter. Just because these birds are in your yard and not out in the wildlife does not mean they are completely safe from predators. There are still many threats to these birds in your yard, such as squirrels and raccoons. Precautions can be made to help prevent this. One thing you can do is to not make the entrance to the box too large. It should be big enough for the bird to easily get in and out of. If it is made too big, then predators will be able to get in too. If you are in an area where garden snakes are common, that should be taken into account as well. A metal shield around the tree or a pole holding the nesting box should be able to prevent any snakes from getting into the box. There are many things to keep in mind when creating a nesting box to attract birds to your yard. However, once it is complete, it is entirely worth it. Not only are you adding even more beauty to your home, but you are also helping birds that may not have a shelter otherwise. We encourage everyone with trees in their yard to create a nesting box. If you have any questions, please do not hesitate to reach out to us, as we are happy to help you attract Portland area birds!